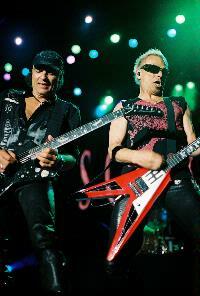 The Scorpions made a stop in Chicago (August 10th to be exact) on their relatively short Humanity-Hour 1 U.S. tour. Chicago has always had a long history with these German rockers dating back to B'Ginnings in 1979 on the Lovedrive Tour. 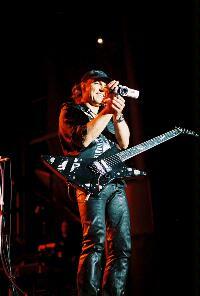 Almost 30 years later, the Scorpions rocked our city again (not that there was any doubt they wouldn't). The guys have not lost any of their flare for putting on a great show while making it look so damn easy. Like a well-oiled machine, they came, they rocked, and they conquered. The Scorpions took the stage with a new tune "Hour 1" and from the very first drum beat and guitar riff, they had the crowd in the palm of their hands. Hot on the heels of the opener, the guys quickly launched into "Coming Home." Most of the bands that I tend ot see live are older 80's bands (I hate to use that term because almost all of the bands ares still releasing great music) and I'm surprised at how energetic they still are on stage. All the guys kept moving around and giving this Chi-town crowd an awesome visual show. I was surprised they played "The Zoo" next. Normally this is reserved to mid-set status but they played it pretty early this time out. "No Pain, No Gain" was next and I was glad they played something from their criminally ignored Face The Heat album. Since I'm sort of an old school fan, the next one-two punch of "Make It Real" and "Coast To Coast" really had me jumping. The guys slowed things down a bit with "Send Me An Angel" and I have to say, Klaus Meine still has an incredible voice. He hasn't lost one bit of power and he still managed to hit all the notes with ease. Another old school tune "Loving You Sunday Morning" was next and based on the crowd response, this was definitely a fan favorite. Before launching into a couple of new tracks, namely "Humanity" and "321," they pulled out an odd one. "I'm Leaving You" from Love At First Sting was performed and I can't remember ever seeing this one live. It's a great track and one that should find its way into their set list more often. If anyone tells you the Scorpions were done years ago, tell them to grab a listen to new track "321." As my friend Chris would say "it's a smash" and it fits nicely alongside the older tunes inthe set. The first signs of the Blackout album were next with two quick tracks. "Dynamite" was first and that quickly morphed into James Kottack's drum solo. I normally don't like solos but Kottack really made it entertaining. He not only got the crowd involved but the other members joined him on stage for it. It was a unique solo and I must say, one of the best ones I've seen in a long time. Title track "Blackout" bookended the drum solo and they finished off the set with "Big City Nights." It was the perfect ending to the set because they played at the Charter One Pavilion which is situated right by the lake with the Chicago skyline as the backdrop. Never ones to finish there, the Scorpions played 3 songs for an encore. "No One Like You" and "Still Loving You" started things off before the guys ended the evening with "Rock You Like A Hurricane." If I had one complaint, it would be that there were no tunes played from their Unbreakable CD. It is one of their strongest releases and I was a bit disappointed that it was completely ignored. That being said, the Scorpions put on a great show and as always, no one left without having had a great time. I have seen these guys quite a number of times and this show stands up with any of them.